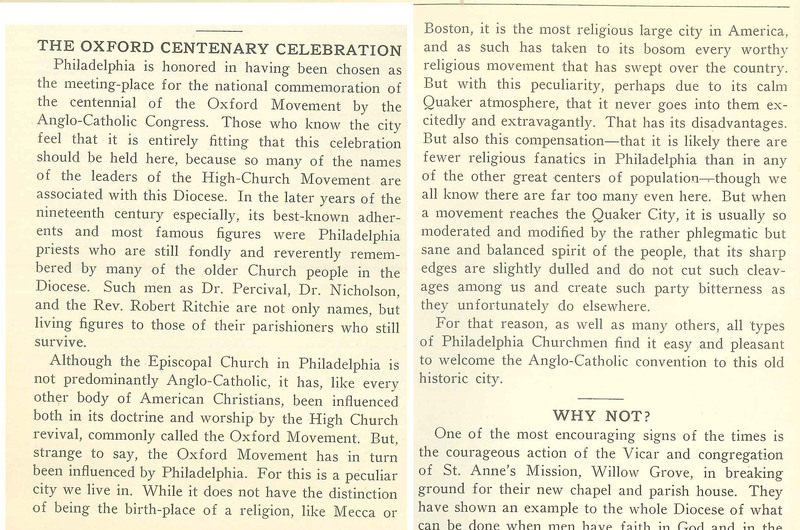 This entry was posted in Church of St. James the Less, St. Mark's Church (Philadelphia) and tagged Anglo-Catholics, Catholic Congress of The Episcopal Church, Henry R. Percival, High Churchmanship, Isaac L. Nicholson, Oxford Movement, Robert Ritchie on March 26, 2015 by mjk38. 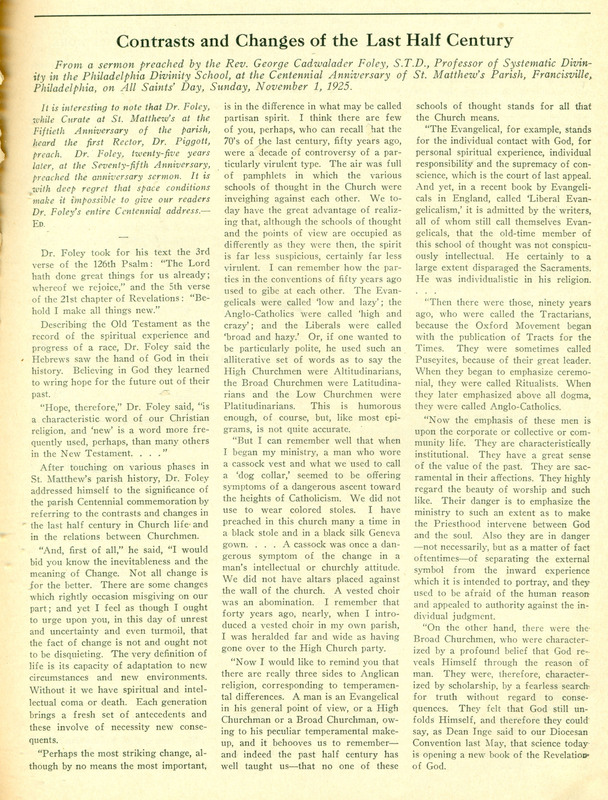 This entry was posted in Church of St. James the Less, Church of the Holy Comforter (West Philadelphia) and tagged Allegheny West, Anglo-Catholic Parishes, Charles Jarvis Harriman, East Falls, Edward Ritchie, Falls of Schuylkill, Francis Marion Taitt, High Churchmanship, North Philadelphia, Northwest Philadelphia on October 20, 2014 by mjk38. 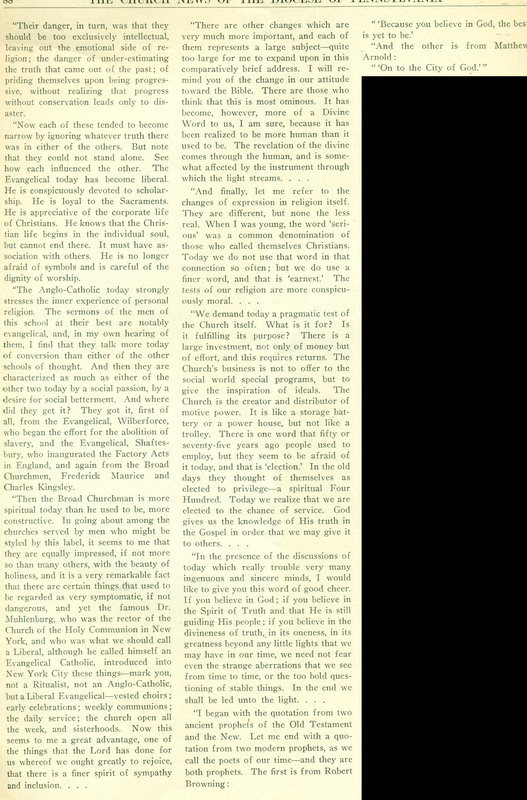 This entry was posted in St. Matthew's Church (Francisville) and tagged Altitudinarians, Broad Churchmanship, Church News of the Diocese of Pennsylvania, Francisville, George Cadwalader Foley, High Churchmanship, Latitudinarians, Low Churchmanship, North Philadelphia, Oxford Movement, Philadelphia Divinity School, Platitudinarians, Ritualists on April 16, 2014 by mjk38. 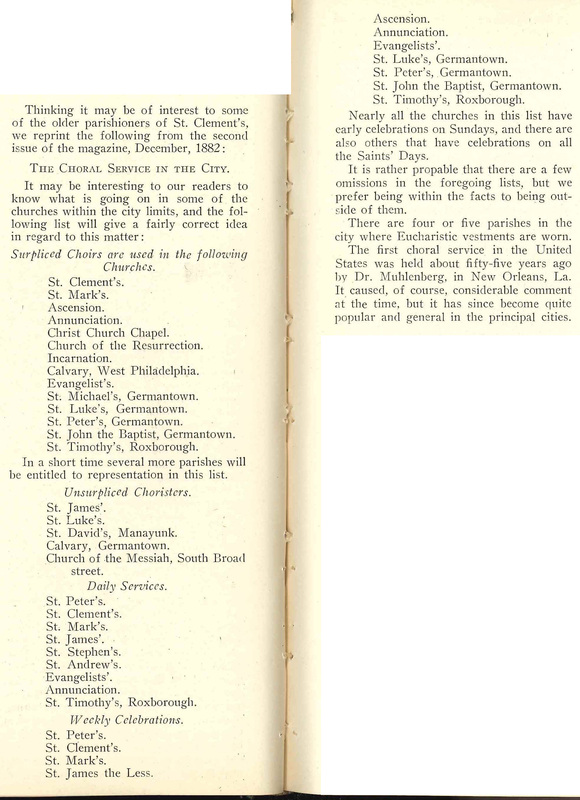 This entry was posted in Calvary Church (Germantown), Calvary Church (Northern Liberties), Christ Church Chapel, Church of St. James the Less, Church of St. John the Baptist (Germantown), Church of the Ascension, Church of the Atonement, Church of the Evangelists (Southwark), Church of the Incarnation, Church of the Messiah (Southwark), Church of the Resurrection (Broad and Tioga), St. Andrew's Church (Philadelphia), St. Clement's Church, St. David's Church (Manayunk), St. James's Church (Philadelphia), St. Luke's Church (Germantown), St. Luke's Church (Philadelphia), St. Mark's Church (Philadelphia), St. Michael's Church (Germantown), St. Peter's Church (Germantown), St. Peter's Church (Philadelphia), St. Stephen's Church (Philadelphia), St. Timothy's Church (Roxborough) and tagged Anglo-Catholic Parishes, Broad Churchmanship, Choral Service, High Churchmanship, St. Clement's Magazine, Surpliced Choirs, Unsurpliced Choristers on February 2, 2014 by mjk38.